In the Indian Premier League 2019 or IPL 2019 match 19, Sunrisers Hyderabad (SRH) take on Mumbai Indians (MI) at the Rajiv Gandhi International Cricket Stadium in Hyderabad. Meanwhile, Sunrisers have won the toss and have opted to bowl first. Sunrisers are unchanged from their last match while Mumbai Indians have made couple of changes and dropped Yuvraj Singh. 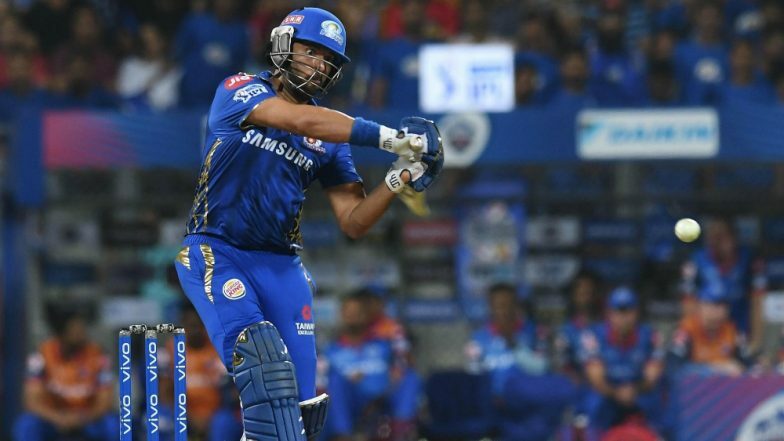 Check out live score updates of SRH vs MI IPL 2019 match here. Sunrisers’ campaign has got a new life after their defeat against Kolkata Knight Riders (KKR). The former champions won three matches on the trot and now top the IPL 2019 points table. SRH have six points from four matches as they look to make it four in a row. Sunrisers’ opponents for the day, Mumbai Indians have managed to win two out of four matches and are placed sixth on the IPL 2019 points table (before completion of CSK vs KXIP match). SRH vs MI, IPL 2019 Live Cricket Streaming: Watch Free Telecast of Sunrisers Hyderabad vs Mumbai Indians on Star Sports and Hotstar Online. Meanwhile, tonight’s encounter is the 13th between these two teams. Sunrisers lead the head-to-head record with seven wins while Mumbai Indians have won five. Interestingly, since 2016 in six matches played between these two teams, Mumbai Indians have only emerged victorious once. Sunrisers Hyderabad Playing XI: David Warner, Jonny Bairstow(w), Vijay Shankar, Manish Pandey, Deepak Hooda, Yusuf Pathan, Mohammad Nabi, Rashid Khan, Bhuvneshwar Kumar(c), Sandeep Sharma, Siddarth Kaul. SRH vs MI, IPL 2019, Hyderabad Weather & Pitch Report: Here's How the Weather Will Behave for Indian Premier League 12's Match Between Sunrisers Hyderabad and Mumbai Indians. Mumbai Indians Playing XI: Quinton de Kock(w), Rohit Sharma(c), Suryakumar Yadav, Ishan Kishan, Hardik Pandya, Kieron Pollard, Krunal Pandya, Jason Behrendorff, Rahul Chahar, Alzarri Joseph, Jasprit Bumrah.